– Create a comfortable environment in terms of CO2 & humidity. – Purge pollutants such as VOC and NOX. Our home is an important part of our everyday life, and good air quality contributes to a healthy living environment. Good air quality is achieved through effective ventilation . 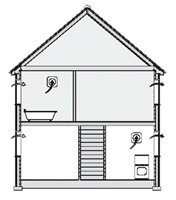 An effective ventilation strategy incorporates extract ventilation from “wet rooms” (such as a kitchen or utility) to remove stale air, supply ventilation to habitable spaces (living rooms or bedrooms) to provide fresh air, as well as purge ventilation (achieved by opening a window e.g.) to rapidly remove stale air and odours. Until recently, the structure of the house itself would allow enough air to infiltrate through gaps in windows and wall, in addition to passive wall vents. However, as building methods and materials improved, and energy efficiency standards became tighter, this infiltration was reduced to a minimum. Excessive ventilation greatly reduces the energy efficiency of a building by increasing the load on the heating system. Fresh air drawn in from the outside must be heated to a comfortable temperature by the building’s heating system. Stale air, exhausted to the outside, carries heat energy away from the building. Excess ventilation therefore, can reduce the energy efficiency of a building. New methods of air supply are required. These methods of ventilation must balance competing for the demands of comfort and hygiene, with the requirement to reduce energy consumption. Intermittent Extract Fans & Background Ventilation. This system comprises of background ventilators such as trickle ventilators fitted to windows, or standard hole-in-the-wall ventilators, with extract fans fitted in wet rooms. The background ventilators act to supply air to habitable spaces, while intermittently operated extract fans provide the extract ventilation removing odors and excessive humidity from wet rooms. The simplicity of the system Does not benefit from “intelligent” sensors, unlike system 3 (DCV). 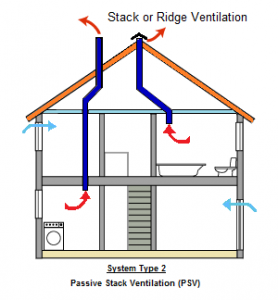 Passive Stack Ventilation and background ventilators. A passive stack is a non-mechanical approach to ventilation, where air vents are located in various locations around the dwelling. Using the principle of convection, currents allow the movement of air through the ducts. With passive stack system, airflow rates are very much weather dependant. Strong gusts can cause over ventilation and surges in ventilation rates; little or no wind may result in inadequate ventilation. The system is completely uncontrolled. Large amounts of cold air can be drawn into the building, increasing the heat load. Demand-controlled ventilation (DCV) automatically regulates ventilation based on actual demand using a suitable sensor. DCV can be triggered by occupancy sensors, moisture sensors or air-quality sensors detecting carbon dioxide or other pollutants, or a combination of these. The difference between DCV and basic intermittent ventilation is that DCV operates automatically, without requiring any manual user intervention. A central fan provides a continuous background extraction rate. A controller in the fan maintains a constant air pressure in the system, increasing or decreasing the fan speed as required. Humidity sensitive extracts located in wet rooms open and close depending on room humidity. If a particular room has high humidity, the extract opens. When the extract opens, this causes a pressure drop in the system. The fan automatically increases speed to return to the target pressure. The more extracts open, the higher the extract rate is. Other models of extractor can be triggered by occupancy, carbon dioxide or other air contaminants. Coupled with the boosted fan speed, this combination means that stale air is extracted only from areas where air quality is below the required standard. The system ventilation rate is always matched to the actual demand, reducing energy consumption by fans and reducing overventilation and heat energy consumption. Continuous Mechanical Supply & Extract with Heat Recovery. 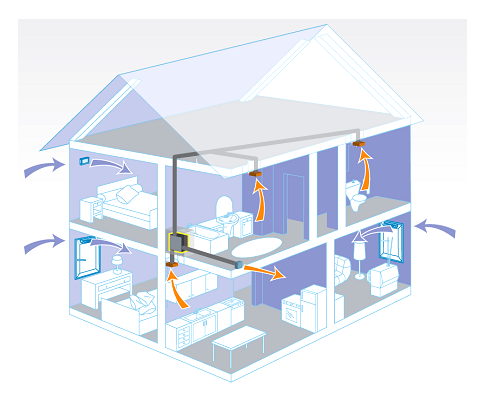 Mechanical Ventilation with Heat Recovery (MVHR) continually removes stale moist air from wet rooms, while supplying a balanced amount of outside air directly to habitable rooms. The difference between MVHR and other ventilation systems is that with MVHR, the heat energy carried by the stale air is used to partially heat the fresh intake air through a heat exchanger. This reduces the demand on the building’s heating system and minimises the loss of heat to the outside atmosphere while maintaining fresh clean air. Fresh cold air is drawn in from the outside through an intake grille. It is then passed through the heat exchanger where it is heated by the stale exhaust air. The fresh, warmed air is then supplied through sealed ductwork to the habited rooms of the house. The supply rate and extract rate are balanced to maintain comfortable air pressure and reduce draughts. It is important to note that the intake and exhaust air streams never mix. Easy to demonstrate building regulations compliance. The vast majority of Solar Thermal systems installed in Ireland are of the pressurised variety. The solar circuit is completely filled with a heat-transfer fluid, which is then pressurised to increase its boiling point. A circulating pump drives this fluid around the solar circuit, transferring heat from the solar collector to a storage tank. An expansion vessel is fitted to damp out changes in fluid volume caused by thermal expansion throughout the day, maintaining a steady system pressure. Safety is provided in the form of a blow-off valve on the pump station, which, in the event of a system over pressurisation, will allow some of the heat-transfer fluid to escape to a catch tank. Click here to view a detailed schematic of that type of system. Flexibility in the piping routes. Less complex pipework. Requires less skill to install. Lower the cost of installation. required to regulate temperature and avoid stagnation. During cold weather without protection, panels are at risk of freezing. Requires anti-freeze. Anti-freeze loses its performance with time. User interaction, regular service and anti-freeze liquid replacement are required, which represent an extra cost for the customer. Requirement for “heat dump”. Requires storage space. Pressurisation of the solar circuit comes with its own drawbacks. The most notable drawback is Stagnation. The collector is always filled with fluid, even when the system is not actively circulating. 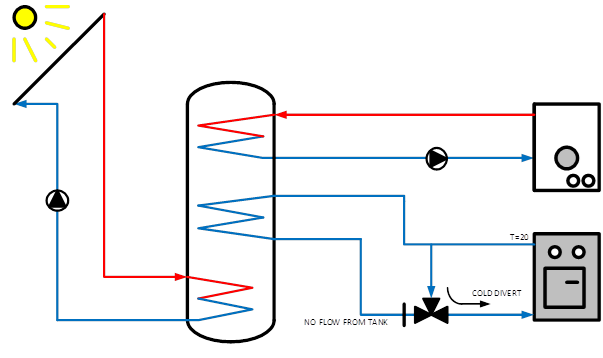 If the system settles into stagnation on a hot day, continued heat production in the collector will raise the temperature of the heat transfer fluid to the point where it begins to boil. This has the potential to cause the system pressure to increase, ultimately causing the system blow-off valve to activate and dump solar fluid, leading to a loss in pressure when the system cools. Sustained high temperatures can also damage system components, while accelerating wear and tear. Stagnation mitigation solutions such a heat dump do not entirely eliminate the risk. If the heat dump has not been correctly sized to match the power output of the solar collector then the system still has the potential to overheat. If the system should lose electrical power, there will be no pump to drive the circulation of the fluid, allowing the system to stagnate anyway. A drainback solar system consists of a circulating pump, solar panels, a drainback vessel, a controller and some form of thermal store. Nothing else is required. Drainback functions on the same basic principal as a conventional pressurised system. 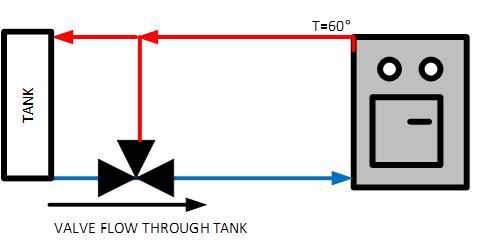 A circulating pump pushes water up to a solar collector on the roof, where it absorbs heat from the collector, then carries it back down to the hot water store. 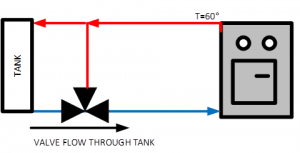 The difference between drainback, and pressurised solar systems is that, when the circulating pump shuts off, heat-transfer fluid is allowed to drain under gravity from the solar panels down into a dedicated drainback storage vessel. The solar circuit is unpressurised. This drainback vessel is mounted such that the fill level is somewhere above the level of the circulating pump, ensuring the pump never runs dry and that no air can enter the circuit. A good gravity flow is also required between the solar panels and the drainback vessel to ensure they properly drain. Maintenance is simplified , customer intervention is not required. System is not pressurised. No pressurisation kit required when installing. Reduces the amount of parts. No Glycol (anti-freeze) required. Water can be used as solar fluid. More efficient heat transfer. Wall mounted dual-line pump station. Rapid and easy install. Time and money savings. Drainback systems rely on gravity. Gravity fall is required in pipework. Planning and careful installation required to ensure this. Does not suit every project. No overheat protection or anti-freeze is required. The chief advantage of Drainback solar is that, when the circulating pump is not operating, the collector is dry. In summer, there is no fluid in the collector to boil. In winter, there is nothing in the collector to freeze. Thus, the system cannot enter stagnation and cannot freeze solid. The requirement for a heat-dump and anti-freeze is eliminated, simplifying the installation. 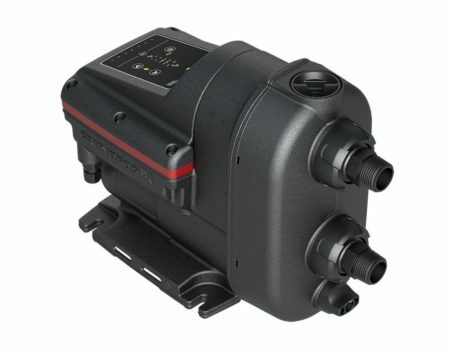 There is no longer a need for holiday recooling functions and frost-protection modes within the solar controller. The system is also passively safe – should the pump lose power, all fluid will drain from the collector to the drainback vessel as normal. The lack of pressure minimises the potential for leaks. Pipe corrosion and seal degradation due to acidic antifreeze is eliminated, improving system reliability and robustness. Drainback Solar is a simplified, safe, robust and reliable solution. Currently, Greentherm are the only company in Ireland offering Drainback solar thermal systems. Geentherm systems are based around Veridian ‘Clearline’ solar panels. These are one of the few flat-plate panels that are specifically designed for the Irish climate. All Clearline panels and flashing come a BBA agreement cert, verifyingtheir suitability for use as a roofing material. Underfloor Heating is a proven technology which offers attractive benefits when integrated as part of a heating solution into residential or commercial buildings. By its nature it is a radiant heating system as opposed to convection based solutions such as radiators. Radiant systems heat the people and objects in the room as opposed to the convective ‘top down’ stratified heat of radiators. The result is evenly distributed heat, resulting in lower operating costs and greater comfort. In new build construction of residential units wet screed systems are the preferred method of installation on the ground floor. Upper floors can pose some design issues, namely structural requirements in timber frame construction or joisted upper floors require significant structural enhancement to allow a screed to be poured. As introduced above, the building structure is designed to facilitate the application and mass of screed, and in addition to an insulation layer either through the use of precast flooring, structural joists etc. No pipe joints within the building fabric. Structural requirement. Delays to project from screed drying. These systems are factory manufactured chipboard or ply panels with integrated under floor piping. The panels are typically placed on top of the joists in place of the floor boards, and typically laid in back to back arrays. Piping protrudes from one end of each flooring panel. The panels are piped in series within the floor joists with a main flow and return piping running along the end of the panel. The finished floor is laid on top of this product. building fabric, often with no access. Rapid thermal response. Very labour intensive to ensure a successful installation. Uneven joists can require a substrate of ply or OSB to be applied first. Insulation is required between the joists to prevent heat deflection and overheating to the zone below. Cannot be repaired if damage. In this configuration battens are applied a set distance below the top of the joist and plywood is used to form a carrier layer between the joists. Insulation is manually cut and inserted between the joists on the carrier plywood which fills the void almost to the top of the joist. The insulation is routed continuously along the centre line. 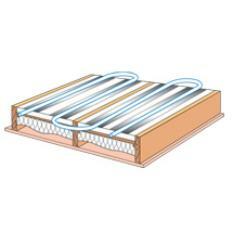 The aluminium diffusion tray is laid parallel to the joist span on top of the insulation. The routed channel is designed to accommodate the u-channel in the centre of the aluminium tray. This u-channel in the diffusion plate provides a recess to take the underfloor heating pipe. At both ends the joist is routed to form a notch to allow the pipe to turn 180 degrees. No joints in floor. Complex room designs can make it difficult to always comply with regulations for notching. Due to the lack of mechanical fixing, expansion and contraction during heat up and cool down lead to unwanted noises. 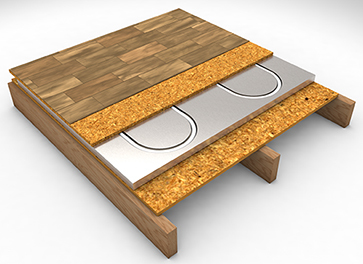 Requires a layer of ply or OSB to be installed before the finished floor is applied. 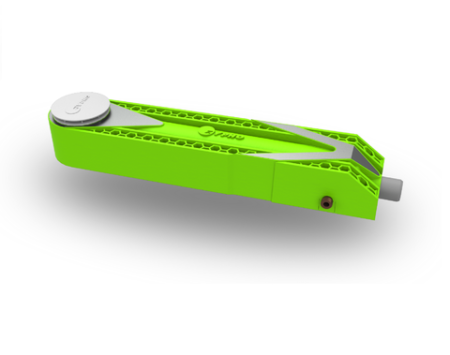 This solution is available in configurations as low as 13mm deep. The EPS panels contain a series of factory cut groves which run along the linear length of the panel to hold the pipe. The complete panel including the grove has a factory applied aluminium foil diffusion layer. The layer ensures an even distribution of heat and prevents heat deflection the zones below. The floor joists are covered in plywood or a similar substrate and the EPS panels are bonded to the ply substrate layer. The pipe is then laid into the panel groves. Several manufacturer approved tile adhesives can be applied directly to the product and tiles can be applied directly on top. To facilitate the use of a soft floor finish eg carpet or cork a 6mm floating plywood floor can be laid on top of the EPS panels. Wooden floors can be laid directly onto the panels as a floating floor. No pipe joints in the floor. Higher skill level required than screeded under floor installations. Contact us to find out which system is most suitable for your project. 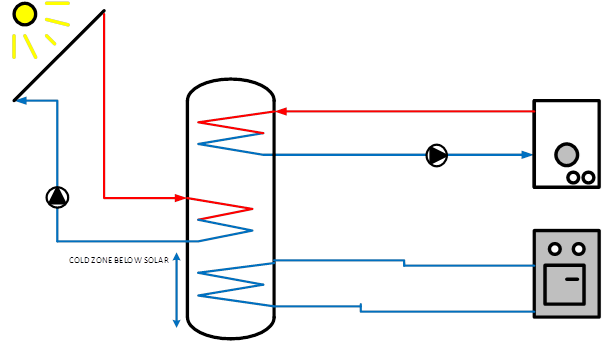 Both the solar and the boiler circuit are pumped circuits – water is pushed around them by a circulating pump. The stove circuit is different; there’s no pump. For safety reasons it uses a gravity flow to heat the tank. The temperature difference between a hot stove and a cooler tank creates a natural circulation of water between the two. This is sometimes called a Thermosiphon. This, however, can cause some unusual problems. On good days the solar panels will heat the bottom of the tank, warming the water inside. On other occasions, this water may be heated by the boiler. Especially if it is warm out, the stove will likely not be lit – so will stay cold. In the diagram above, its outlet temperature is a cold 20°C. If this heat came from your solar panels, then you will have to make up for the loss with an immersion heater or by calling in the oil boiler. If it came from your boiler alone, then you will have to run your boiler for longer. Either way this is costing you money. And nobody likes the surprise that comes from turning on what was expected to be a nice-hot shower, only to be met by a rush of lukewarm at-best water. The bottom of the tank will remain cool unless the stove is lit, meaning there will be no temperature difference to start the Thermosiphon. 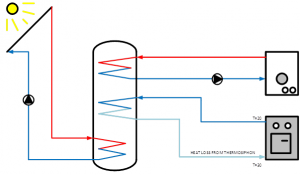 This solves the Thermosiphon problem, but introduced a new one. This approach effectively halves the amount of hot water available from the solar panels. 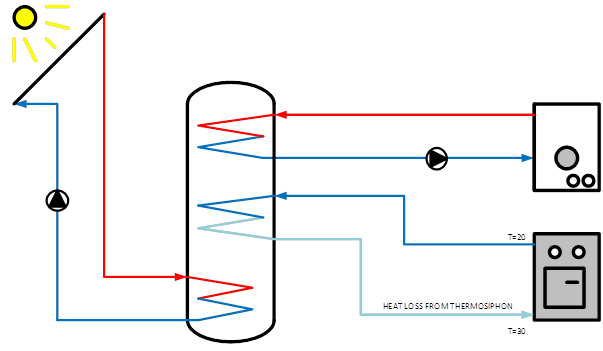 Whatever would’ve been lost to the Thermosiphon, is never received in the first place. Instead of losing hot water, now you never have it. Also, if this is a modification to an existing system, you would have to factor in the cost of hiring a plumber to do the work, or the time to do it yourself. Three to Five hours would be a good minimum for a skilled plumber. Clearly, not an ideal solution. It solved one problem, but in a way creates another one in the process. At Greentherm, we’re an engineering company first and foremost. We’re all engineers here. What this means is, we’re always looking for the best solution to a problem. Both in terms of cost-effectiveness, and long-term efficiency. A Solid Fuel Loading Valve is a device which is designed to automatically regulate the flow of water coming out of a solid-fuel boiler or stove. The purpose of the loading valve is to allow the stove to heat up quicker and burn hotter, reducing coking of the flue and minimising internal corrosion. It does this by diverting the flow of water coming from the stove back towards the stove in a short loop, bypassing the rest of the heating system. When it warms up, the valve switches open, allowing water to flow to the tank, as seen below. But what relevance is this to our Thermosiphon problem? When the solid fuel stove in the above system is cold, the Loading Valve will be closed. It will effectively isolate the stove in its own short loop until the stove heats up. This means that cold water in the stove cannot flow towards the tank. This also means that warm water from the tank cannot flow back to a cold stove. If the stove is cold, the valve is switched to divert. When the stove is lit the valve will open once the water has reached a high enough temperature, allowing heat to move up from the stove to the tank. If the stove cools down, the valve closes, preventing circulation through the tank. Fitting a solid fuel loading valve to the system eliminated heat losses from a Thermosiphon. The efficiency of the system was improved. The Loading Valve also improved the combustion efficiency and lifespan of the stove by fulfilling its original function. Physically adding the valve and divert loop took a competent plumber two hours. Including the cost of materials, this solution not only worked out cheaper for the customer to implement, but left her with a much more efficient system to boot. Most importantly, this solution is safe*. The Solid Fuel Loading Valve is fully automatic. It isn’t reliant on electrical power or any external control unit- it’s operated solely by the heat in the water. This valve won’t be left stuck in position by a power failure, or quietly forgotten when the homeowner goes to sleep. Contact Us now to see how we can provide similar solutions to your heating and renewable energy problems. If you have the same problem with a system loosing heat through a cold gravity circuit purchase Solid Fuel Loading Valves from us here, and implement the above solution yourself. *Provided the System has been installed in accordance with regulations and industry best-practices. Multi-Energy Jaspi 500L Thermal Store. Noticeably heavier when compared with the products of a leading competitor, Jaspi Thermal Stores are manufactured from thick plates of corrosion-resistant steel. More weight means more steel, better construction and enhanced robustness, reliability and resistance to leaks. High density insulation is then physically baked onto the inner tank, before an outer protective casing is added. Multiple tappings are fitted, with a coils already installed for Solar, and two Domestic Hot Water coils. A baffle plate allows a high-temperature boiler to be efficiently combined with a Heat Pump or Solar Thermal System. Tanks, built like a Tank. Jaspi Thermdal Stores are manufactured from thick sheets of high-quality steel, guaranteeing a long, leak-free service life under demanding conditions. Flexible tappings allow for the combination of any domestic heat sources for maximum efficiency and reliability. An internal baffle ensures that low temperature heat sources in the tank bottom will always have work to do. A pair of indirect domestic hot water coils instantaneously create hot water only as it is needed, for maximum system efficiency. All tappings complete with Leak-Detect couplings, making any problem with sealing on installation clearly visible, verifying the integrity of the installation. Designed specifically to fit through the average household door and maximise storage volume using the minimum amount of space. Designed with frigid Finland winters in mind. Each Store comes with high-density Polyurethane foam insulation, baked on for outstanding efficiency and thermal performance. We know our products and understand the customer’s needs. We have the in-house know-how to do what it takes to ensure your specifications are met. Click Here to visit our online store and order. There is nothing more expensive than a cheap thermal store. What’s saved in the purchase price is quickly lost to recalls, repairs and replacements. No matter your application, your Jaspi Hybrid thermal store can be trusted to give decades of hassle-free service. Call us now, at 01 5314781 for no-obligation sales and technical inquiries. For more detailed information on the Jaspi range, send a message to info@greentherm.ie. 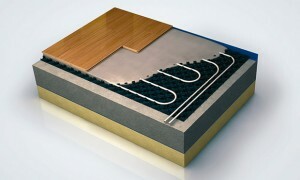 Visit our website at www.greentherm.ie for more information on other products we offer. In our second, we saw how the choice of heat-source could affect the temperatures we store water at, and what affect changing the storage temperature had on the amount of water we needed to store to get the same performance from the system. 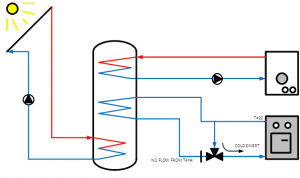 Here in our final post, we will have a look at one of the most important components in a Greentherm central heating system; the buffer tank, Thermal Store or Combi-Cylinder. We’ve already seen that to efficiently meet the hot water demands of a modern home, the cylinder has to be far larger than the traditional copper tank tucked away in the hot-press. The actual amount of storage required is calculated by us here at Greentherm as part of our design process. Based on the plans supplied to us by your architect, we calculate the heat load and hot water demands for your home and match them with a heat source capable of delivering the required performance. We then size the buffer tank based on the most efficient operating point of this source and the demands we have calculated. This is a fairly involved process the details of which go far beyond this post, especially when modern regulations such as Energy Performance and Carbon Performance have to be accounted for. For argument’s sake let’s assume that, based upon the plans and specifications we’ve received from your architect, we’ve calculated you need a 1000 Litre Thermal Storage tank to meet your new home’s hot-water and heating requirements. How much space would that take up? It certainly won’t fit in with the towels, so somewhere else must be found. We recommend that a dedicated plant-room be set aside for your hot water storage and heating systems, both for ease of maintenance, ease of access and for your convenience. This dedicated plant room will have to be large enough to accommodate the Thermal Store and its plumbing. So, how large will it have to be to fit our specified Store inside? The Volume we require to store 1000 Litres of water is, conveniently, 1m³. A cube-shaped tank, 1 Metre by 1 Metre by 1 Metre will be large enough to hold 1000 Litres of water. Unfortunately for us it’s not that simple; the majority of Thermal Stores are cylindrical. The basic geometrical formula for the volume of a cylinder is πR²H. H, or the Height of the cylinder will generally be limited to the ceiling height of your home, less approximately 200mm for headspace to simplify installation. R, is the radius of the cylinder – or the distance from the centre of the cylinder to its outer wall. It is important that the depth of insulation not be included in this. This calculates out to a cylinder radius of approximately 43cm. This gives a total vessel diameter of nearly 90cm. On top of this, most cylinders will have an insulation blanket that also needs to be accounted for. An extra 5cm on each side of the cylinder for insulation means a 1000 Litre cylinder will be at least a metre wide when finished. This is too wide to fit through most doors unless you opt for a tank such as the Jaspi Oval tank which has been specifically designed to fit through a standard doorway. It will be necessary to allow for sufficient clearance around the sides of the cylinder for proper plumbing access. Depending on the works required, at minimum this could be another 30-50cm, meaning a 1000 Litre cylinder could require up to 1.3M of space in a room to comfortably install and plumb. This will, of course, require some special arrangements to install, to ensure the cylinder will fit. These special arrangements will need to be discussed with your architect in the design and specification phase. The normal capacity we would usually install would be normally be in the range of 500 to 800 for a buffer tank, and typically up to 900 L for a combi-cylinder – so 1000 Litres is a little on the large side, but still within the realms of possibility. That brings us to the end of this short series of postings, we hope you’ve found them informative. Contact us if you have any queries or questions on what we’ve gone through in this series, we’ll be more than happy to answer them. How do Solar P.V. Panels Work? Greentherm supply Solar P.V. and Solar Thermal Systems to the Irish Market. 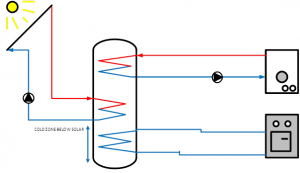 Solar Thermal has been discussed before, but what about Solar P.V.? It seems like magic, that a simple flat sheet of silicon can create electricity from the sun. So how does it happen? By adding other materials to the Silicon crystal, it’s current carrying characteristics can be precisely changed, making it more susceptible to current flow. Positively Doped (P-type) Silicon has been altered so that it has a slight positive charge. Negatively Doped (N-type) silicon has been doped to have a slight negative charge. When P-type and N-type silicon are combined together, they form what is known as a P-N Junction. A natural barrier forms between the pair that will only allow current to pass in one direction, and only when a certain switch-on voltage has been reached. Think of it like a dam in a river. Only when the river level rises above the level of the dam wall will water be able to flow over . Also, a dam blocks water from flowing back up the river – in the event of a tidal flood or similar event. A P-N Junction connected in reverse will block current flowing backwards. The P-N Junction forms the core of most modern electronics, the most basic use being in a Diode – a device normally used to limit the flow of electric current to one direction. Semiconductors don’t behave like normal electrical devices. They have a number of strange characteristics. Once a diode has ‘switched on’, for example, it’s effective resistance drops to almost nothing. This means that – even for small increases in voltage – a rapid increase in current will be experienced. This switching function makes them very useful for modern electronics hardware – such as computer processors. The ‘switch’ however, doesn’t necessarily have to be the voltage across the junction. It can come from any source. A Photodiode is a diode that is switched on by light-energy for example. But, how do we use this to generate electricity? Light is a form of energy. When light strikes an object, it has the potential to knock electrons loose within that object, generating a small voltage. This is the photoelectric effect. Some substances are more prone to it than others. However, due to the nature of most substances, these voltages tend to rapidly dissapate unless some sort of barrier exists between charges. The p-n junction in a solar cell prevents these charges from dissipating with in the cell, allowing them to build up. 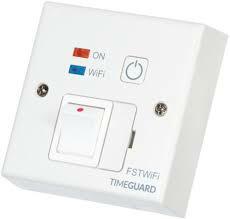 This creates a voltage across both terminals of the cell. 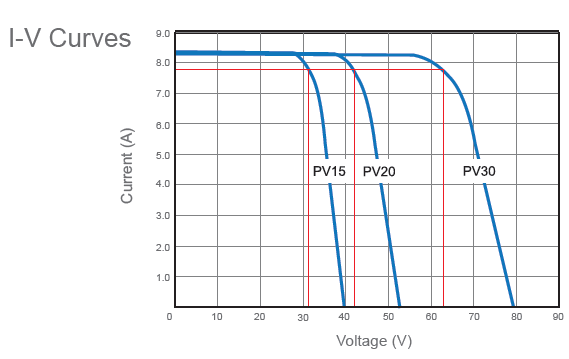 This voltage is limited by the characteristics of the solar cell – including its size and the quality of the p-n junction seperating the charges. The lower the quality, the easier it is for charge to leak back across. Eventually, this leakage matches the rate of charge production, and creates the Open Circuit Voltage of the panel. If these terminals were connected with a piece of cable however, current would begin to flow. Under ideal circumstances, a Solar Cell functions as what’s known as a Current Source. This means that, when connected to any load it will attempt to push a fixed current through that load – say 3 Amps. It will increase the voltage to whatever is required to push that amount of current through the circuit. The amount of current the cell attempts to deliver is directly related to the amount of solar energy falling on it. The more sun, the higher the amount of current that will be delivered. It’s that simple. There is, however, a limit. Remember above, the Open Circuit Voltage? If the resistance to current flow through the load is high enough, then the voltage required to drive current through the load will get so high that more and more of the charge will begin to dissipate within the panel. The voltage will slowly increase to the Open Circuit Voltage, while the delivered current will drop off rapidly. A side effect of this is that the dissipation of energy through the panel will cause it to begin to heat up. This heating reduces the performance of the panel somewhat by making it easier for charge to leak across, limiting voltage and current further. 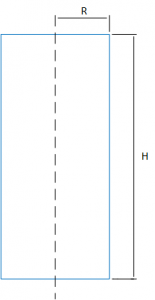 The I/V characteristic Curve for the Viridian Clearline range of Solar Panels Greentherm offers, is shown below. It shows curves for the 250W, 300W and 500W PV panel models. It can be seen that the maximum operating current off all three models of panel remain the same – the only change is the maximum voltage this current is supplied at. It’s also clear that the open circuit voltage of the 500W panel, is double that of the 250W panel. This is due to how the panels are manufactured – from a whole bank of individual solar cells connected together in series, such that their open circuit voltages are added to each other. Effectively, these lines represent the operating power of the panel, for various loads. The delivered power through a load can be easily calculated from these graphs for any attached resistive load. The Maximum Power Point of the panel – where it is operating at its most efficient – is achieved when the voltage and current multiple (VxI) is at its maximum. This happens right as the current begins to decrease, and is marked on the graph above with a red line. 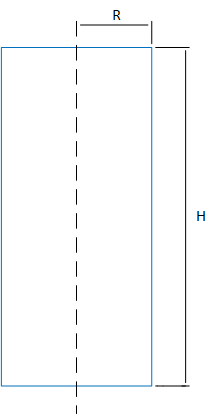 These lines represent the Maximum Power Voltage and Current on the datasheet. This point, is where the panel achieves it’s rated power output, or Watts-peak (kWp, or Wp). If a load is directly connected to the panel, it’s unlikely that the panel will be operating at it’ maximum power point. For example, if a battery to be charged were connected directly to the panel, the voltage in the system will be clamped down to the battery voltage. 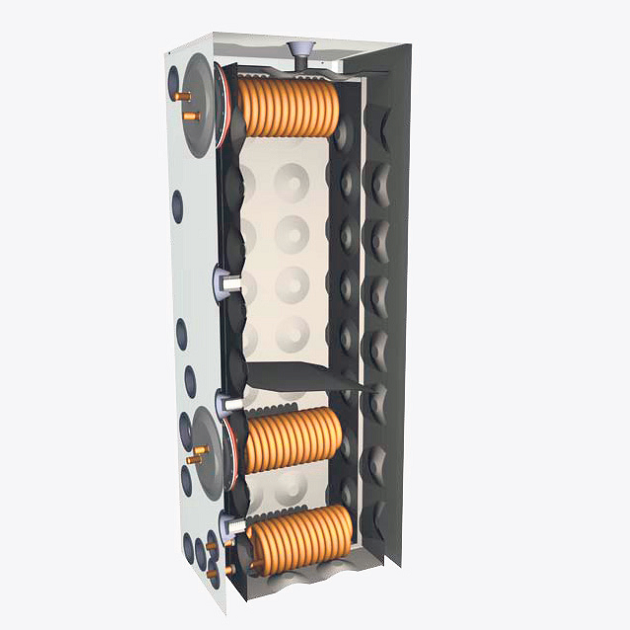 The maximum current delivered will always be limited by the characteristics of the panel – in the case of the above panel, approximately 8 Amps. With a 12 Volt battery connected, this would limit the maximum delivereable power to the battery to less than 96W – less than half of the rated power output. The get the best out of a Solar PV Panel, the load has to be matched to the Maximum Power Point of the panel. The Maximum Power Point is not necessarily a fixed point on the graph. It will vary according to the amount of sunlight being provided to the panel. The maximum output current of the panel is directly related to the amount of sunshine received by the panel. Shading of individual panels or modules within the PV system will also effect the maximum power point. It becomes necessary to have an electronic device – either a charge controller, or inverter for grid-tie connection, with Maximum Power Point Tracking capability. 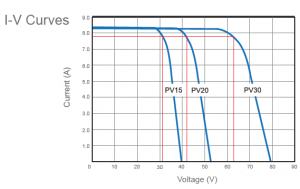 Devices with MPPT capabilities can adjust their electrical characteristics to ensure that the connected Solar Panels are always operating close to their regime of peak efficiency, regardless of what load is connected to them. Greentherm sell charge controllers and inverters with this capability. Contact us for more information on the designing, specification and installation of Solar PV systems, or to arrange a no-obligation quotation or consultation.